While they are especially important for the elderly, we think that every shower should have a good non-slip mat in it, as it doesn’t matter how old you are if you slip and fall in the shower. These accidents can be catastrophic, leading to serious injury, permanent damage, and in some cases, they can even be fatal. Therefore, you really should protect your family with a good shower mat to make sure that no one slips and hurts themselves. Here at Apex Health and Care, we take pride in bringing you the best bathroom aids and home safety products in one convenient place, saving you the effort and time of having to search through the internet, and with these safety mats, we’re really pleased to bring you this great list of our tops picks. All of them are very high quality. and all of them come built to meet regulations and having been tested to health and safety standards. So check out these great mats and make sure that having a shower is always a pleasant and relaxing experience that can be enjoyed without the fear of slipping. There are generally two types of shower mat. One should be placed inside the shower or bathtub itself, and it will have suckers or anti-slip strips on the bottom to ensure that it stays in place. 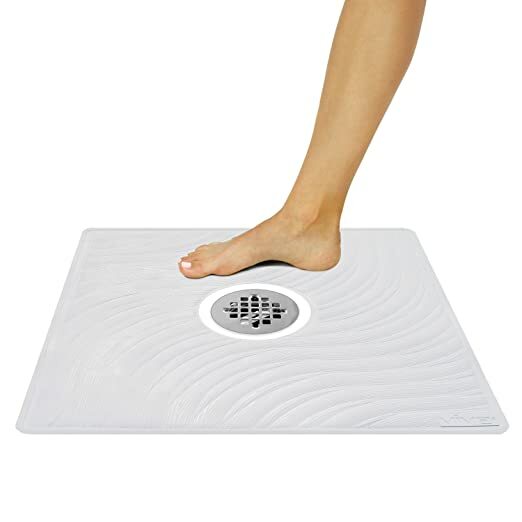 The purpose of this mat is to provide a surface that is easy for your feet to grip on to and one that won’t slip, so you will avoid slipping on the smooth and slippy wet floor of the shower and tub. The bath and shower can be especially dangerous places, despite the fact that we shower everyday, because with all the water, soap, shower gel, shampoo and other fluids that run off our hair and bodies and onto the floor, they can get very slippy, which can make them especially hazardous for the elderly, young children, people with mobility issues or those nursing foot and leg injuries. For children, they are wonderful as they will allow your child to play and mess around, as kids usually do, in the bath without the risk of falling over. The other type, often called bathroom mats, are simply to go outside the bath or shower so you can stand on them and dry yourself off. It is also important that this kind of mat, which os often made of fabric, also have some kind of non-slip protection, as you don’t want to slip when you come out of the shower. Remember, water can often spill out onto the bathroom floor, so you can also be at risk here. We will focus on the first kind. Here are a few things you should consider when buying this kind of mat. Size – No matter how lovely and aesthetically pleasing your new shower mat looks, its not going to be very effective if it can’t fit in your tub or shower cabinet, and it sue is going to be a pain if you want to DIY and trim it down. You definitely do not want a mat that curls up the bathtub walls, so please make sure that you measure the area in your bath or shower first and buy a mat that will fit in their nicely. At the same time, you don’t want to go for something that is too small either. Don’t really on your memory or ‘guess-timating’, write down the proper measurements and thus safe yourself the hassle of sending the mat back for replacement or having to try and cut it down yourself. Anti-Slip – It is essential that all of these mats have a good, solid and reliable anti slip surface on their underside. This is usually a kind of sticky rubber material or suction cups that will ensure that the mat stays stuck to the bottom of the shower and does not move or slip when you stand on it. It doesn’t hurt to double check that the mat you are buying has this, but it will hurt if it doesn’t and someone has an unfortunate slip in your shower. Cleaning – With all that water, soap, shampoo and grime running through them, it is essential that your mat gets a good clean out every now and again. While many people just automatically assume that the shower mat can be thrown in the washing machine with the rest of the laundry, you will find that this is probably not the case. They may require special kinds of detergent or cleaning fluids to be used on them, and they may be unsafe for use in the machine or dryer. It might be a good idea to look for one that has simple cleaning instructions if you have a busy schedule and don’t want to take the extra time to clean the mat. Color – Now, we all know that safety comes first and should definitely be your main concern when buying a shower mat. However, you also don’t want to mess up the color scheme of your bathroom with one, so you may also wish to find one that is a good color for your bathroom. Many people opt to go with a while or cream colored mat, as this usually blends in with the bath, whereas others may wish to co with one that matches the other features in the room. For example, if there is a lot of stained wood in your bathroom, you can find a brown mat that will match it. Help make your bathroom, spa or shower the safest place in the house with the strength of the gorilla grips! 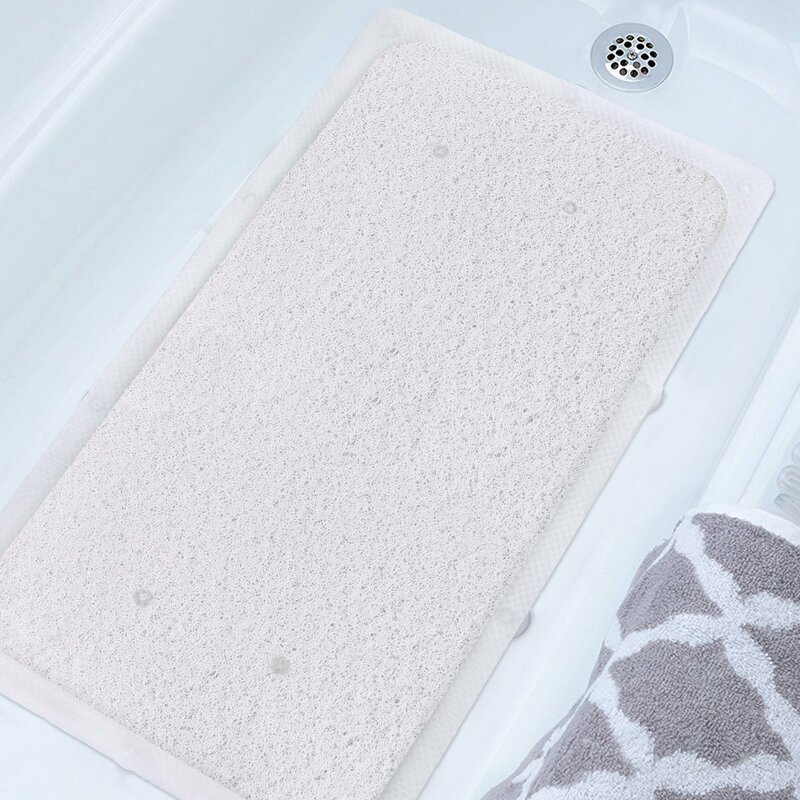 This antibacterial bath and shower mats have over 300 Gorilla Grip suction cups that are sure to hold the mat in place even on the slipperiest of surfaces. This mat is also very hygienic, as it is made of anti-bacterial and mildew resistant materials, and it has drainage holes on the underside to encourage moisture to drain away. It is BPA Free, Non-Toxic, Phthalate free, and Latex Free, so it will be ideal for people with allergies or sensitive skin. This is a very practical mat too, as not only is it available in a number of different colors so it can match your bathroom, it is also machine washable, so you don’t have to worry about hand washing or anything like that. For those with busy lifestyles who want a great, safe and no nonsense shower mat,, this is one of our top picks. Looking for something to keep your elderly relatives or young children safe while in the shower? We’ve got just the mat for you. 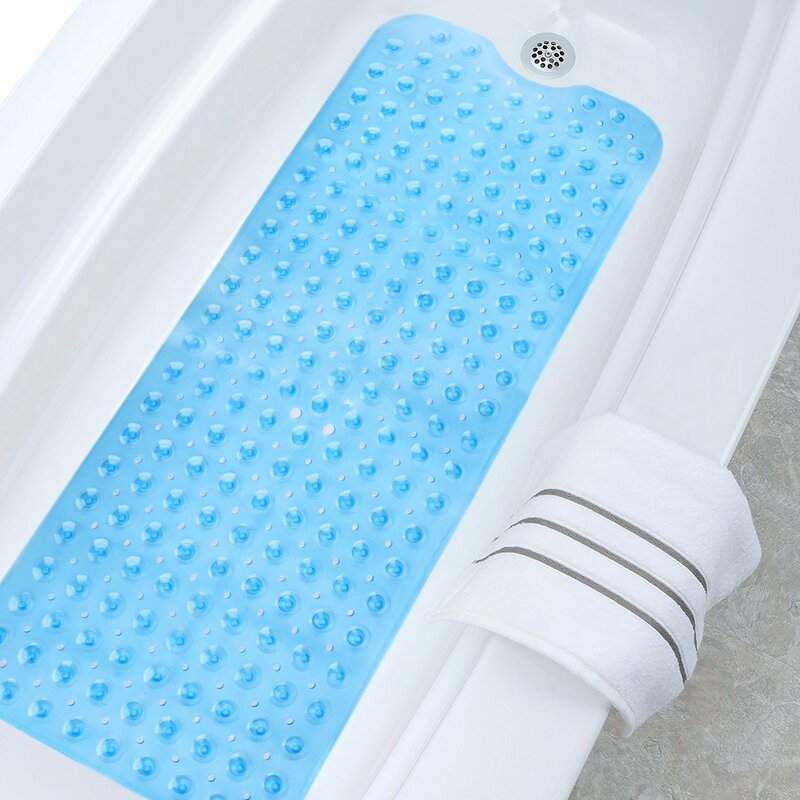 This great bathing aid has a super strong antislip grip from 200 individual suction cups on the under side that make sure that the mat stays securely attached to the floor. This has a unique suction cup design that works amazingly even when the shower is wet. There is also a special 6” drainage hole in the center that allows liquids to drain away easily. . This bathroom mat is 22” by 22”, so it will cover a large area of the shower floor, and its special textured surface will give your feet excellent grip and stability while you are in the shower. It is also treated with antibacterial agents to protect the mat from mold ad mildew, and it is completely latex free as well. As you can see from the picture, this is a square mat, and as such it is intended for showers and shower cabinets, but we wouldn’t recommend it for showers in the bathtub, as it probably won’t fit this. However, for showers, you’ll be hard pressed to find a better mat. Prevent slips and make sure all the family can shower in confidence and ease. Looking for a safe and stylish bathtub mat to protect your loved ones while they are in the shower. Got elderly relatives or young children in your household? Then look no further. 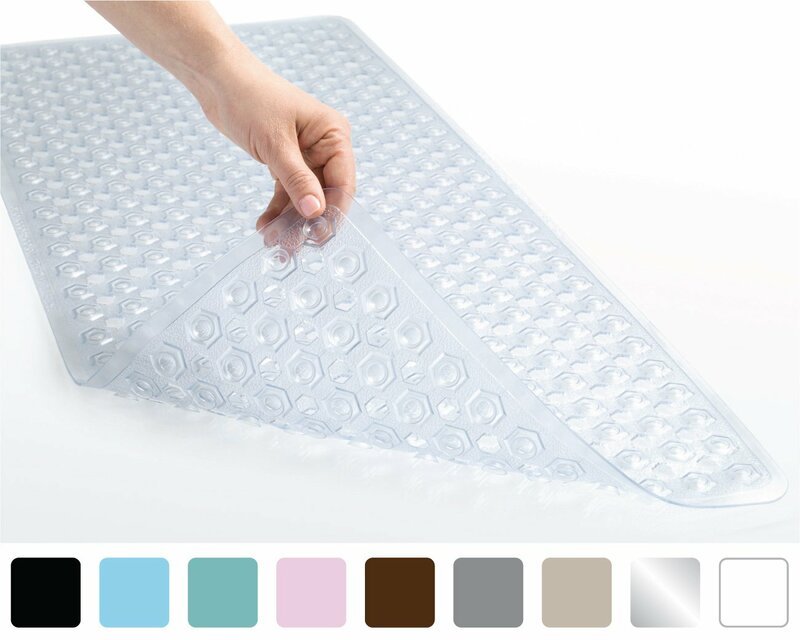 These mats are very safe, as the underside has over 200 suction cups to keep everything secure and give you a wonderful non-slip surface in order to make sure that no one slips and has a nasty injury. Shower time should be enjoyable and carefree. ad this mat will help you keep it so. This is also a very hygienic product, and we’re glad it is as shower mats get covered in soap, grime, shampoo and more. This has been antibacterial treated, and it has draining holes underneath to let all that water and fluid drain out. It will be great for sensitive skin too, as it is BPA-free and woven of high-quality, allergen-free vinyl. We really love how practical this one is, as it comes in two options for different sizes, a selection of different colors, and it can also be machine washed. So its safe, practical, and great for those with busy lifestyles or long work hours. This non-slip and very sturdy shower mat is made with eco friendly PVC materials, and offers great protection and security for anyone wishing to take a shower on one. With over 200 suction cups on the underside, you can be sure that everyone will be secure and safe while showering on it. As such, this will be ideal for elderly and children. The vinyl is durable and long lasting, and the rectangular shape should fit very well in almost every shower. Best of all,this can be cleaned easy, as it is machine washable, and it also has over 170 draining holes in order to help keep that scummy water and shampoo flowing through and not getting stuck in to create mold. This is anti-bacterial too. This is available in blue, grey, teal and translucent colors, so hopefully you can find one to suit your bathroom decor. 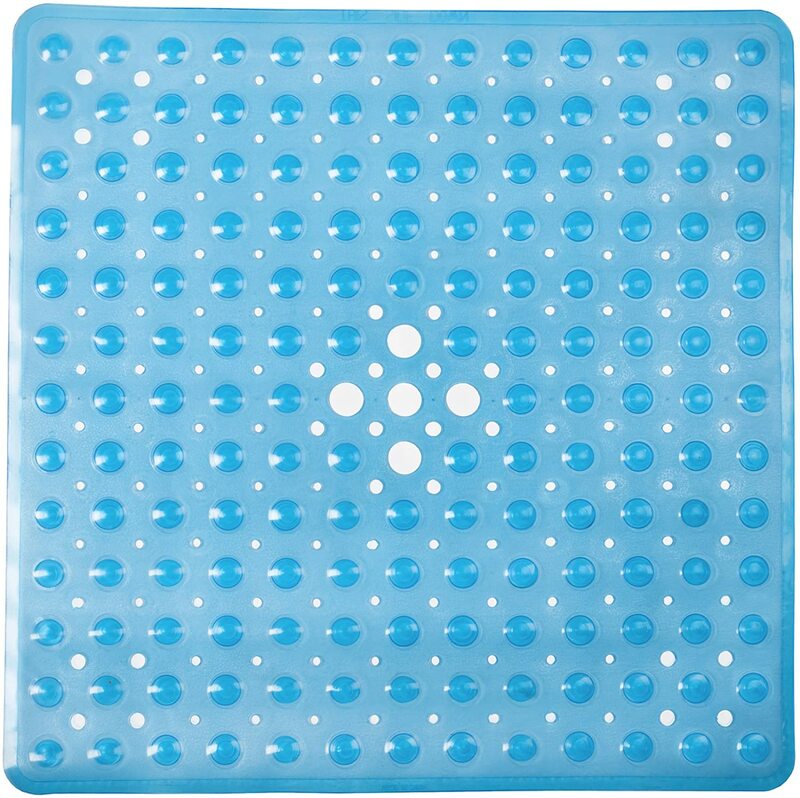 With its hundreds of specially engineered and extra large suction cups made usuig innovative GripTight ™ Technology, this bathrom mat will make sure that everyone enjoying your shower can do so without being worried about tripping or slipping, and it will be great if you have young children. This is made of high-grade PVC materials, and it is allergen free, also free from BPA, phthalate esters, latex, cadmium, lead, and bromine. Therefore, this is great for children’s sensitive skin as well as those with allergies. This has been made with busy mum and dads in mind, as most dirt and grim can easily be rinsed off with water. However, it is also safe for machine washing, so that is an option to you as well. . Nothing quite beats that soft feeling of loofah under your skin, so if you want a shower mat made of this soft and spongy material, we recommend this one. Kids will really love bathing or showering with this under them. 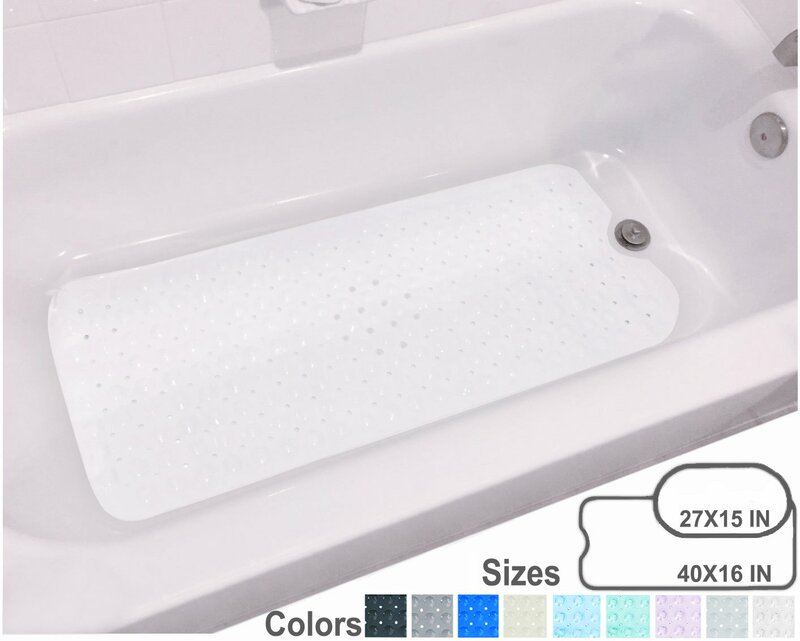 This also comes in a clear white color, so it will match with most bathrooms and baths. WE recommend this for families with young chilren, as the soft loofah surface will feel great under the soft skin of little feet.